This week has been all about plants and gold, so I figured I’d end the week with that theme! 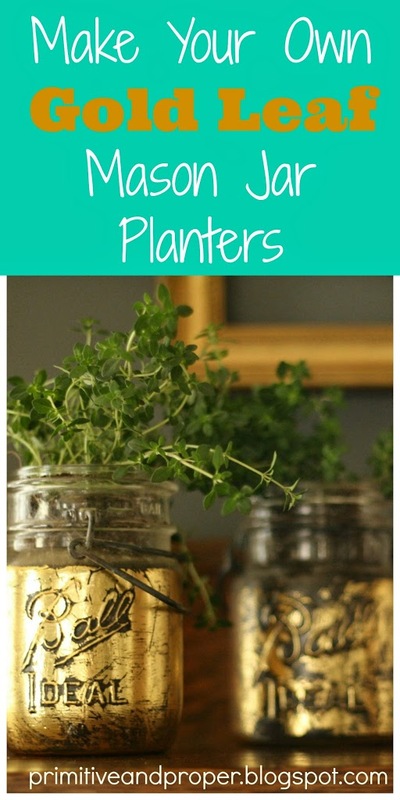 A few weeks ago when I was working on my gold leaf hanging insulator succulent garden (a guest post I did for Tatertots and Jello), I also pulled out some vintage mason jars I had on hand. I used the same process that I used for the insulators but in case you didn’t see that, I will repeat the steps here. 1. I painted the jars with Artisan Enhancements sizing where I wanted them gilded and allowed that to sit and get sticky for 30 minutes. 2. Once it was sticky, I applied Artisan Enhancements gold leaf which comes on a roll. It is applied shiny side out, matt side pressed onto the sizing. 3. I peeled away the roll, which left the leafing stuck to the jar… Below you can see what the matt side looks like and you can see where it stuck on the jar from the roll. 4. 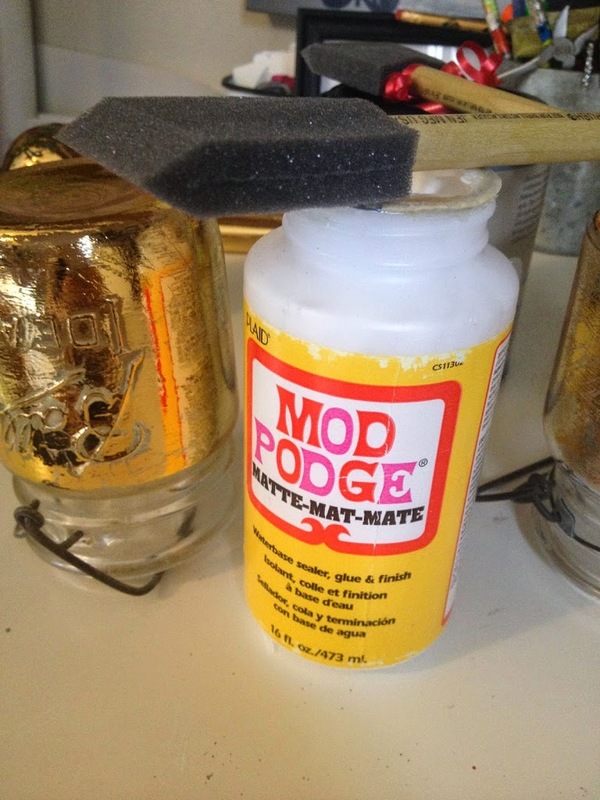 To seal it and also end the sticky feeling which remained in some areas, I applied Mod Podge. 5. Once they were dry, I filled them partially with potting soil, and added lemon thyme to them (which smells amazing! 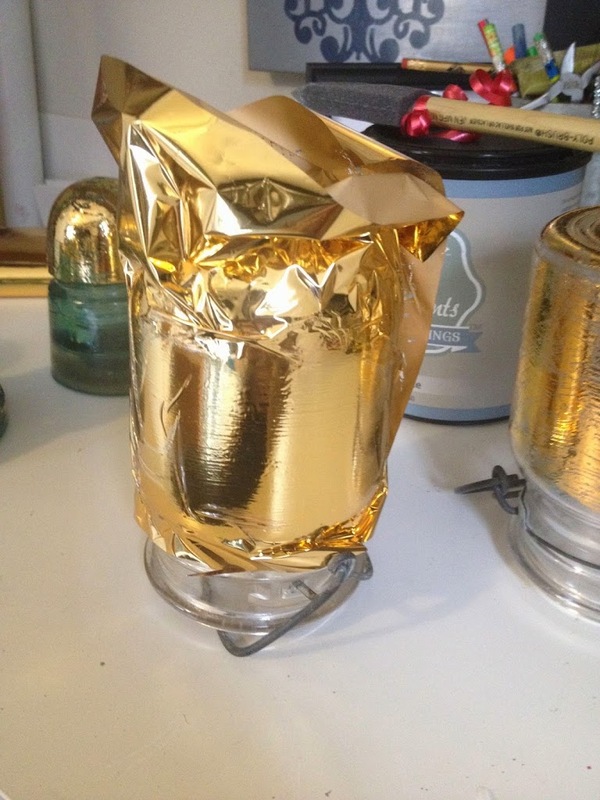 When they were finish I had gorgeous gold leafed jar planters, and beautifully fragrant hands! 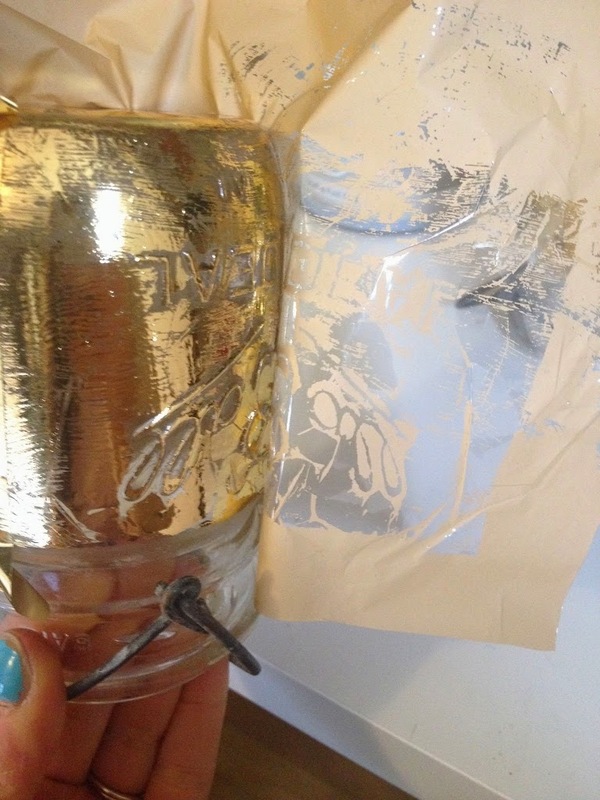 I have told you before, I just can’t stop gold leafing…. I suppose there are worse addictions. Look… so shiny and pretty! I actually gave these to Kelly and Denise to thank them for coming down for the weekend…. I actually said to them, “Thank you for your ‘thyme'”. He he. And finally, I wanted to let you know I will be taking next week off from blogging! I will be busy getting ready for the barn sale as well as the American Odyssey Relay (I think I am as ready as I will ever be for that!). My good friend Julia and I have both been feeling the need for a break, so we decided to declare next week our Spring break! I wish you all a happy Easter, and I will see you on the other side of 200 miles (don’t worry, only 17 of those are mine!)! Wish me luck! Go team Lunachicks!!! Oh, and one more thing…. I will still be on instagram! Much like I can’t keep away from gold leaf, I can’t keep away from you entirely. Love the planters so much! And I’ll be cheering you on in my mind. Go Cassie and yay for spring break! What a great little project. I need to get my hands on some gold leafing. Good luck next week. Looking forward to following along on instagram! I love how the gold rubbed off the raised words on the jar. So so pretty with a plant inside. Happy Easter, Happy SPRING BREAK and good luck on your ODYSSEY Cassie!!!!!!!! More gold goodness – so pretty! Hope you all have a wonderful Easter. Maybe the Easter Bunny will bring you some gold treats! Those are awesome! Wish I had seen those before my wedding… I would have totally done it! ok, this is officially my favorite project from gold week on P&P 🙂 I might need some for my porch. Hopefully there will be some gold at the end of your Relay. 😉 Seriously, I hope you enjoy it and have a blast. Good luck! You are on a gold high Cassie! And I’m loving it. Love the shot too. 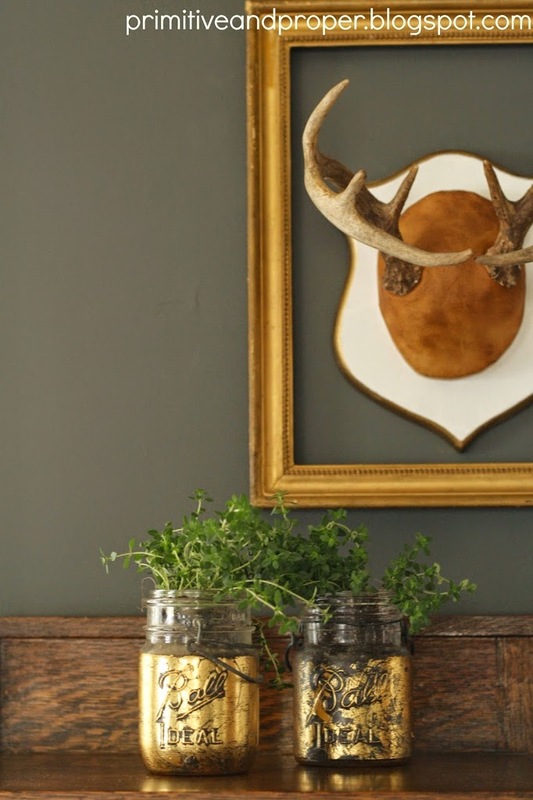 The gold along with the dark wood stain and the grey paint color and the greenery is a fabulous combo. I think these are my favorite. I love how it chipped along the writing, it looks just awesome. And enjoy the week off – and good luck with the Relay!! And good luck with your relay!!!! Xo! 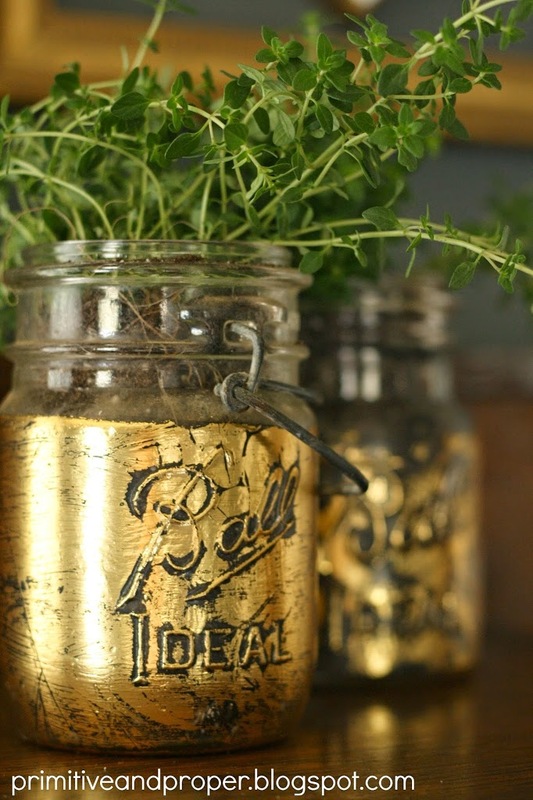 I love those gold leaf mason jars. You always have the most amazing ideas. Good luck on your relay and enjoy your week off. so cute! I think this is my favorite gold leaf project yet! Happy happy spring break!! Aaaannndd GOOD luck!!! 🙂 you will be awesome and can’t wait to hear all about it! 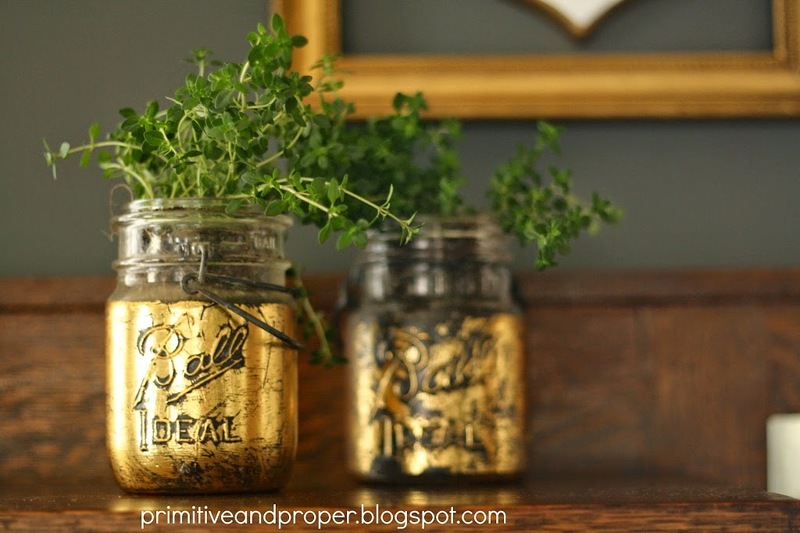 I love those gold mason jars so much! What a sweet gift for your friends. Happy Easter to you and your family and I look forward to following you on IG next week! love these! gold week has been lots of fun :). Have a great spring break; I’ll see you on instagram! I’m so happy you had an entire week of gold. It’s just so glittery and shiny over here. Have fun! I am “breaking” in May, if the weather is decent. Your jars look Maah-ve-lous! The gold looks great with the embossing on the jars. Enjoy your break! I’ll miss you, but I know you are insanely busy. I’ve been breaking for a bit myself! Enjoy it! Cassie! I LOVE these! OMG! Totally doing this! Have an amazing week, friend! You’re the best! GOOD LUCK my friend! Enjoy your break:) We just returned from ours and I wish I could have another one:) On another note, can you believe Ive never leafed anything!! I should really get on that! I am so in love with these Cassie! I’ve never even heard of Artisan Enhancements but will definitely have to try it out now! Have a great relaxing week off! Ooo, I IG’d a pic of a similar project in Country Living mag a couple of weeks ago — I’m obsessed! Totally giving this a try– I think they’d be great on my mantel and in my booth!! Thanks for sharing, Cassie! Those planters are beautiful! 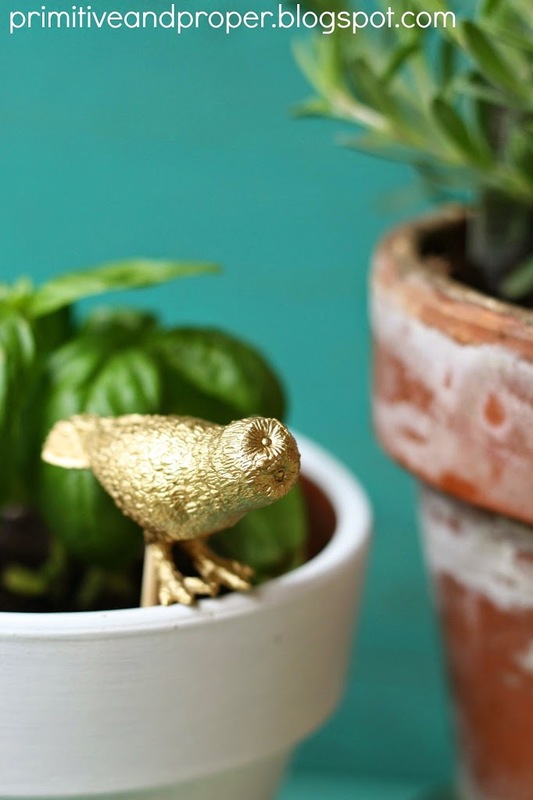 You can never go wrong with a little gold leaf. Good luck on your race, so exciting!! Best of luck in your big race, Cassie! Everything looks better with a little gold on it! 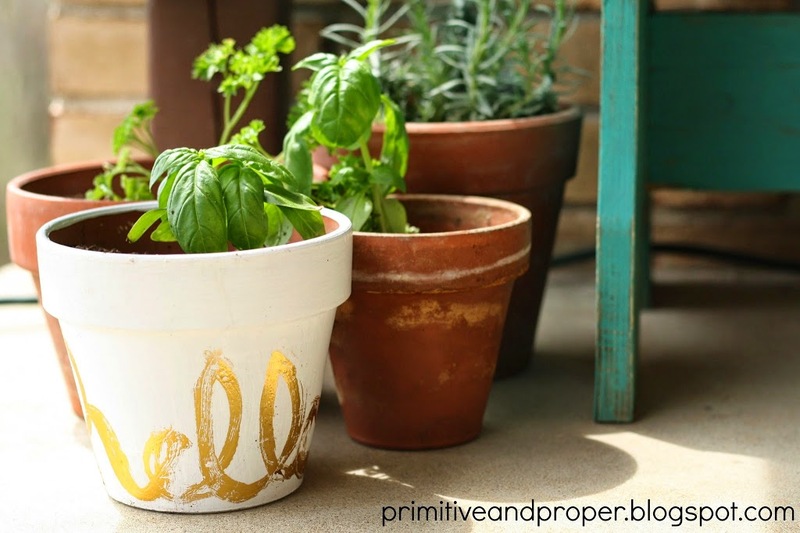 These planters are such a do-able project and come out looking great! They look great! Love the antique feel. These are cool! Love the look. One of the coolest projects I have ever seen so far! My kids love crafts, that is why the cabin is their new studio and this gold leaf mason is going to be one of the big project. Thanks for sharing this wonderful idea! Creative! “Thank you for your thyme.” You kill me. Lettuce not ever think that we could gold leaf too much….it’s impossible. OMG-How did I miss this post?? This is DIY that’s so up my alley. Nice! Who doesn’t love shiny things! These mason jars look great! Milla should look into this for cheapie wedding table decor! 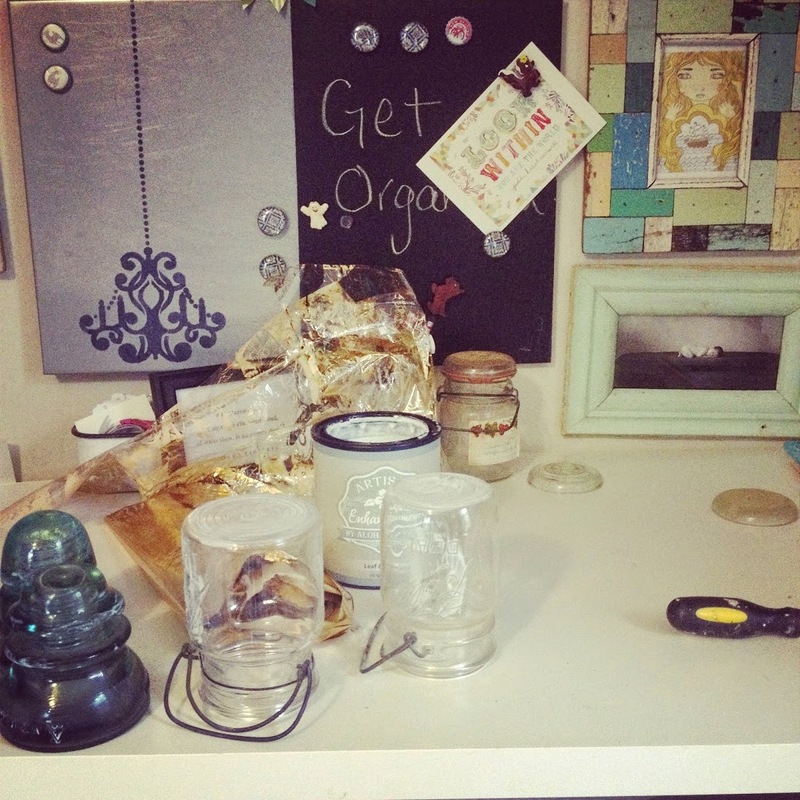 So I’m obsessed with your gold leafing of mason jars – what did you apply to the jar before the gold sheets? I definitely want to do this for my new home, but I’m just a little confused as to what you applied prior to the leafing paper…let me know thanks :):)!!! i used artisan enhancements sizing.